Have I got over my excitement about the Autumn Meadows designer paper? Er... no, I haven't as you can see! 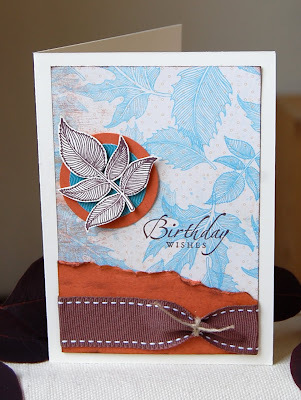 Here's another beautiful paper from the pack, all distressed and gorgeous! I sponged the edges with Chocolate Chip ink, just to give it a bit of definition, and added some torn and distressed Really Rust card stock wrapped with some Chocolate Chip stitched ribbon that I pinched in with a piece of knotted linen thread. The leaf is from the coordinating stamp set Autumn Splendor, and it's layered on a couple of punched circles with dimensionals. A finishing sentiment, positioned with my stamp-a-majig and there we have it! It's another birthday weekend for us this weekend and we'll be having a picnic-in-the-park party, so fingers crossed for the weather. Fingers also crossed for the England football team to astonish us with an impressive performance! Right, I think that's enough crossed fingers for the time being. Have a fantastic weekend, wherever you are. I think this is absolutely beautiful, and will be CASEing like mad ! Well done ! Very beautiful card, Lovely stamps in lovely colors. This is stunning Vicky.The paper is beautiful and the combination of that with the rust is spot on. Lovely! Hi Alex - the distressed edge of the card stock is made by tearing, sponging with a sponge dauber and then (the best bit!) attacking it with my fingernails! Best done when you're feeling a bit miffed! 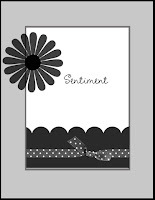 Stnning card and guess what? I have had this paper since the mini catagogue came out but not used it yet! now I will though instead of looking and stroking it!!! Beautifull creation Vicki, those autumn colours are wonderfull. So beautiful!! Amazing colour combo too ... wow!! Very beautiful Vicky ~ Richard thinks so too! LOVE what you did with this sketch! I have lost my mojo and had no ideas what to do with this layout. Fabulous!